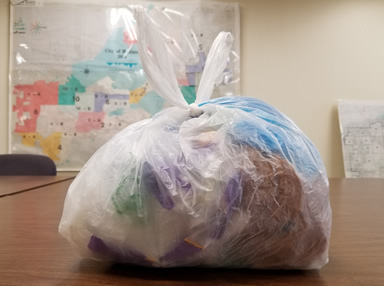 The City of Madison now requires residents to recycle certain clean and dry bags. These bags must be recycled. You can recycle the bags in your green recycling cart by following the instructions below. You can also recycle your bags at one of the retailers on our list. Note: You can still use plastic bags for trash. If you are using plastic grocery bags for your trash you can continue to do that. What Plastic Bags Do I Recycle? If the plastic film is soft and stretchy like a retail or grocery store bag, it can be bundled into the "bag of bags" as directed below. If the film is sticky, clingy, crinkly or, rips easily then it should go into the trash. There is so much plastic film in our lives. And a lot of it is hard to tell if it can be recycled or not. After you feel the bags and you still aren't sure if it can be recycled, place it into the trash. Note: Drawstring bags can be recycled if the drawstrings are removed. Where Do I Recycle My Plastic Bags? Bundle your bags before recycling. Do not put loose plastic film or bags into the recycling cart. Loose plastic bags will get tangled in the sorting equipment at the recycling center. Place plastic bags inside another plastic bag. Tie the bag of bags shut. The bags must be about the size of a basketball. Put the budnle into your green recycling cart. It's best to use a plastic grocery/retail bag for your bags. Using a plastic bag drop-off sites ensures the bags will not become tangled in the sorting machinery at the recycling facility.